There are personalities you never expect to see together. A lot of fans are surprised to find The Three Stooges among the cast of Dancing Lady, yet there they are, cavorting with Clark Gable, Joan Crawford, and other Metro luminaries during that period when the Stooges were affiliated with the great Ted Healy. I like the way they wander in and out of scenes, disrupting the flow of otherwise conventional dialogue exchanges with their seemingly spontaneous antics. 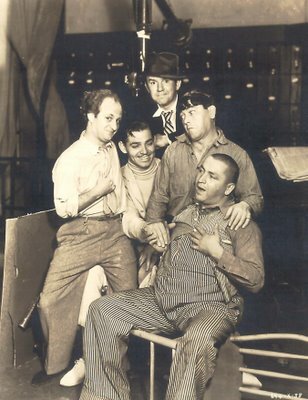 Look closely at those on-stage rehearsals in the movie, and you'll see the three constantly engaged in some obnoxious background activity --- be it arguing with Healy, or noodling around on musical instruments. Director Robert Z. Leonard must have liked their stuff. As for this visitor to Abbott and Costello's Universal-International set, I’d have to assume he was busy doing Against All Flags on a neighboring soundstage, as this pose is dated 1952. 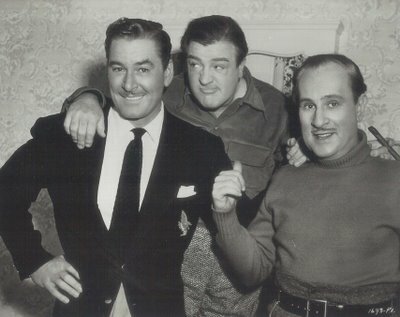 Errol Flynn was friends with the comedy team. He guested on one of their Colgate Comedy Hours, and shared their film-collecting hobby. Print exchanges were frequent among these three, as Flynn liked to show A&C comedies for his kid’s birthday celebrations, while the boys did the same with Errol’s sword-and-sash pics when they hosted their own child gatherings. One time Flynn mistakenly sent over a stag reel for one of Lou's parties, and boy, was his face red! And just to tie all of them together... Bud, Lou and Flynn did the old "Slowly I turn" routine on the "Colgate Comedy Hour" -- the same bit popularized by the Three Stooges! See, everything in Hollywood is connected. I never saw anyone refer to Healy as "great" before. Maybe I haven't seen the right movies. Actually, his short conversation with Edward Brophy in Mad Love is probably among my favorite scenes in any movie ever. I refer to Ted as great every opportunity I get... even maintained tedhealy.com for a couple of years. Suggestion: "Hollywood Hotel". Healy steals the movie. "Dancing Lady" (which is a great picture, by the way) is full of oddball juxtapositions, as any movie with Gable, Astaire, Crawford, Robert Benchley, and the Stooges would have to be.